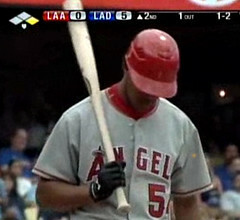 The letter “A” appears to be engaging in a labor action against MLB helmets. 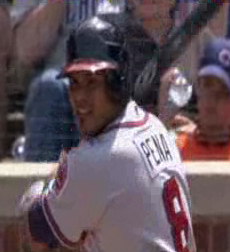 First, as reported here last week, it was Ervin Santana who wore an “A”-less lid; now it’s Braves catcher Brayan PeÃƒ ±a, whose helmet was blank when when he batted in the 9th inning of Saturday’s game against the Cubs. Oddly, PeÃƒ ±a’s “A” was fully present and accounted for earlier in the game. Keep your eye on A’s and Diamondbacks games to see where this wildcat strike turns up next. Manicure Corner: Coupla days ago I asked if anyone had photos of Ramon Hernandez with his fingernails painted white (so the pitchers could see the signs better). Nobody’s come up with pics of Hernandez, but Erica Davis sent along this 2005 photo of the same phenomenon being exhibited by Johnny Estrada. “I don’t know if he’s kept up this practice while with the Diamondbacks,” she writes. Some quick photo research reveals, sure enough, he has. Eye Black, Nail Polish, Etc., Helmets, MLB, Typos/Glitches/Wrong Uni/Etc. 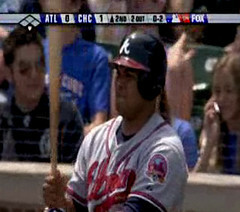 Speaking of Atlanta’s helmets, they still have the dot on the top of their cool-flow helmets. I thought the dot was to make the helmet look more like a hat. If that is the case, there is nothing that can make a cool-flow helmet look like a hat, well unless you put vents in hats. This weekend, Toby Hall of the D-Rays actually got his fingernails painted white on the mound. They brought out what looked like a bottle of White-Out and painted each nail in his right hand. Paul has actually pointed out in the past that most every team has a white dot on the top of their helmet, even teams that don’t have white buttons on their caps. Make that “culprit”. Spelling works great if you can spell. Congratulations on the headline of this post… “A-Hole”…. Well done! Adam just to let u no Tony Pena is wearing the coolflow helmet in both pics, but the pic where the a is on is just at a bad angle. (being a White Sox fan and all hey, I like baseball, what can i say?) too many alternate caps, jerseys and batting helmets in this day and age. Wrote about it in my own blog. The last batting helmet mismatch I saw was when after the 1994 San Francisco Giants made the change, and their old block-lettered / smooth edged cap logo was still used on batting helmets will into the late 90s, seen courtesy of WGN TV of Cubs games. Tho I’m pretty sure that every single team is using the Cool Flow helmet this year, while I don’t have the pics to back it up, it’s been on a LOT of Chicago baseball telecasts and their opponents. I thought this was just for a few select teams. i don’t think i’ve seen any cardinal players sporting the cool flo helmet. In the 1987 All-Star game, Lee Smith had to bat in extra innings, and didn’t bring his helmet, so he was a Cub then but wore an Expos helmet. Anyone have a photo? I watch a lot of Blue Jays games and don’t think I’ve seen any of them wearing the helmets. I think Eckstein wore one today 6/3/06 in St. Louis vs. the Cubs. If it wasn’t him, but there definitely was at least one. 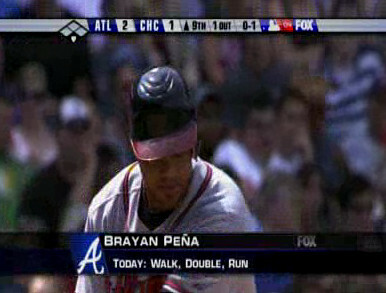 Brayan Pena didn’t have an ‘A’ on his helmet because they accidentally put it in his first name.